Britt Blaser has a weblog called Escapable Logic - Design Study for a New MicroEconomy, and he writes about many things that interest me greatly. And he's one of those people who write so eloquently and put things so precisely that I sometimes feel like a neanderthal when I go back and look at my own writings. John-Perry Barlow is another person like that. Oh, no great reason to cheer me up, I know that I occasionally manage to say something clear and compelling as well. As to Britt, well, I'm from Denmark, so I would have expected from his name that he'd be a pretty blonde Swedish girl, but he's very much a guy. He's been around, and he's a Viet Nam veteran. Yesterday he talks about the difference between leaders and managers, and he also rants a bit about his resentment against somebody like George Bush, Jr. who belongs to a class where he can put an apparent military career on his resume, without really having to show up much. Managing without leading. I can very much understand that. "The current manager-in-residence, George II, went through the motions of flying F-102s on training missions with the Texas Air National Guard during the Viet Nam unpleasantness, in a squadron noted for its population of the scions of the Texas elite. (He was admitted to pilot training ahead of a coupla hundred more qualified other rich kids, despite having flunked the entrance exam. As if that weren't little enough, the record seems clear that he was too busy on a political campaign to show up for service when assigned to Alabama for his last year of duty. Can you imagine what Colin Powell, a real soldier, thinks of this guy? My personal resentment may stem from the fact that I enlisted in the Air Force at the same New Haven office as George, about 3 years earlier. About a week before he enlisted, I was on the C-130 that evacuated the last Marines from Kham Duc Viet Nam (the one before us was shot down on takeoff, killing all 150 souls on board). A month after George started his USAF Adventure Camp, I got shot down at Katum, Viet Nam. The real world has real work to be done. Leaders do that work and teach others. Managers arrange the doing of real work." Although very little has been written about it, the events of May 12, 1968 are among the most heroic of the Vietnam War, in fact of any war. On that day, a handful of American US Air Force C-130 and US Army and Marine helicopter crewmembers literally laid their lives on the line to evacute the defenders of the Civilian Irregular Defense Corps camp at Kham Duc, an outpost just inside the South Vietnamese border with Laos. I think war is a horrible and often senseless thing, but there is something to say for the guts and courage of those people on the ground or in the air who actually DO sfuff, and who end up putting their lives on the line to save the lives of others. A lot to say. "Inside, the sunlight was terrific, the entire space fairly cozy, but very hobbit-like. And with, let's be clear, fairly low resale value to anyone except a total granola-crunching lunatic like yourself, unless there's a nuclear war and living off the grid becomes handy, at which point you won't want to move anyway, but will want to insert steel bars over all the windows to avoid mutant tribes of 16-eyed irradiated flesh-eating Objectivists." 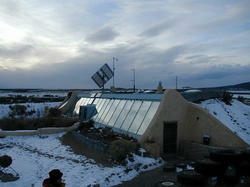 Earthships are houses built of old tires and dirt, and maybe old cans and bottles. Not as crazy as it sounds. It is a way of recycling materials in a sensible way, to build a sustainable, durable, well-insulated house. You can build it yourself. Davide in Italy has been so gracious to translate the "We are the New Civilization" poetic manifesto into Italian. Thanks Davide!! That brings us up to 14 languages: Italian, Spanish, French, Portuguese, Hebrew, Danish, Finnish, German, Russian, Croatian, Slovenian, Esperanto, Interlingua and English. Anybody else? Somebody speak Japanese or Chinese or Korean? Swahili? Sanskrit? Noi stiamo camminando ora, fuori dal passato, per sognare un grande sogno. Noi siamo amici e uguali, noi siamo diversi e unici, e noi siamo uniti per qualcosa di più grande delle nostre differenze. Noi siamo una cultura emergente, un rinascimento dell'essenza dell'umanità. Noi cerchiamo la nostra guida personale, e noi distinguiamo la nostra propria verità. Noi andiamo in molte direzioni, e ancora rifiutiamo di perderci. Noi siamo in tutte le regioni del mondo, noi siamo da ogni parte nell'aria. Noi siamo l'universo che si conosce, noi siamo l'onda dell'evoluzione. Noi siamo in ogni occhio del bambino, noi affrontiamo il non conosciuto con ammirazione e eccitamento. Noi siamo messaggeri dal futuro, vivendo nel presente. Noi veniamo dal silenzio, e noi parliamo la nostra verità. Noi non possiamo essere taciuti, perchè le nostre voci sono con tutti. Noi rispettiamo i cicli e le espressioni della natura, perchè noi siamo la natura. Noi non giochiamo per vincere, noi giochiamo per vivere e imparare. Noi agiamo dall'ispirazione, amore e integrità. Noi stiamo costruendo un mondo che lavora per tutti. Noi intendiamo vivere le nostre vite per tutto il loro più pieno potenziale. Noi reaggiamo reciprocamente nella pace, con compassione e rispetto, noi uniti nella comunità. Noi celebriamo la salute con e attraverso noi tutti. Noi danziamo al ritmo di creazione. Noi parliamo le verità dei nuovi tempi. It is sort of a weird thing when we have an indicator, a statistic, a number for something, it always creates some kind of feedback loop. Some of them are useful, some of them are not. I find it quite useful to have a little graph that shows how many different people have looked at my weblog every day. I guess I feel it is reassuring that the numbers are gradually inching higher. Must mean I write something that somebody finds worth reading. But it also might make you look for meaning where there isn't much. If one day the number goes down quite a bit compared with the day before, I might mistakenly think that what I wrote the day before wasn't to people's liking, or if it suddenly goes up, I might think that people suddenly love what I wrote. And I might try adjusting what I do, based on the numbers. And I'll go crazy. The best advice would probably be to continue doing what I like doing, and care very little whether 2 people or 2000 people read what I write. Likewise, it is probably not very useful to compare one's readership numbers with those of other weblogs. There are many other possible reasons for higher or lower numbers than quality of the content. TimeEurope has a poll that asks readers which country poses the biggest danger to world peace in 2003 - North Korea, Iraq or The United States. That is not a hard question, and the voters are pretty clear on what they think. After I and 73,000 other people voted, the standing was 10.4% for North Korea, 16.6% for Iraq, and 73% for The United States. For most Americans, that's probably a shocking result, or it gets dismissed as bogus, but that is probably because of the scarcity of balanced world news within the United States.